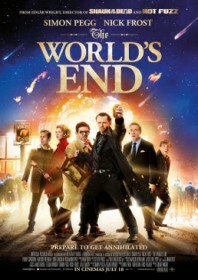 Halfway through this acerbic Britcom from the makers of Shaun of the Dead and Hot Fuzz, there is a discernible twist in the narrative when a gang of hooded youths are revealed to be kung fu fighting cybermen spouting blue blood and smashable ceramic heads, like something out of Doctor Who. Up to this point the film plays like a spirited bromance reuniting a bunch of forty-something school friends who agree to a pub crawl in Newton Haven. The bizarre space invasion story spirals as the characters become more inebriated, and like all bouts of binge drinking it soon descends into squabbles and violence. Edgar Wright, like with Scott Pilgrim vs. the World, is not a director to simply throw a fight scene aside without his customary meticulousness. He recruits former Jackie Chan protege Brad Allen to put a mostly unfit cast through their paces with neatly observed and cleverly choreographed fight sequences. At times, Nick Frost channels a burly Sammo Hung with Pegg his Jackie Chan, agonisingly close to finishing his pint but hindered by brawling limbs that keep knocking the drink from his hand. Labelled as ‘pub-fu’, the action is a clever, innovative triumph. Yet the lads never seem to be in any genuine danger, even when Pierce Brosnan’s head explodes into bolts of beaming light, and it is the film’s tender moments that carry the most weight. The film is most confused when it sobers up, ending on a strange conclusion which veers distantly from all the riotous fun beforehand.